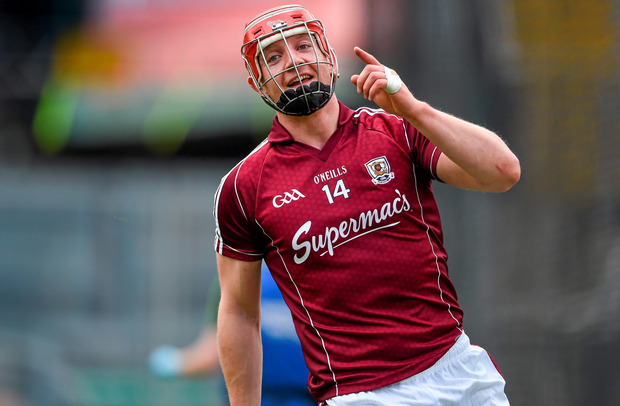 No real questions have been asked of Galway in this year's championship and unless the opposition can upset Gearóid McInerney, that will remain the case. Micheál Donoghue deserves huge credit as he has developed an impenetrable half-back line which is starting to resemble Messrs Walsh, Hogan and Delaney of Kilkenny as they repeatedly break teams down in that area. It isn't just the half-backs, however, as Galway withdraw their two wingforwards as well as midfielders David Burke and Johnny Coen so you have five in front of McInerney, plus the two flanks covered off. Their foundation is based on structure with each player knowing their role. Constantly the goal is for McInerney to sit back protecting Dáithí Burke, as he has through every game in the past two years apart from last year's All-Ireland final where he tracked Austin Gleeson with great success. From puck-outs, and at stages during open play, Galway let you have possession up to 50 yards from your own goal hoping that Conor Whelan and Conor Cooney will put enough pressure on the defender to deny him an opportunity to look up, and that's all that's needed to make things easier at the other end where they have an overload of numbers. Tipperary had the same situation with Conor O'Mahony in 2010 and 2011. He sat no more than 60 yards in front of me at any time - he never moved out of our half - and he seldom needed to switch to the wing because the two half-forwards had that area manned. Wing-forwards now play like wing-backs and the midfielders play like two second centre-backs and if you can work that system, you have a winning formula because your defence is never exposed. But it's a lot easier said than done. Look at Tipp this year. In general play without possession, the distance between full-back, centre-back and the two midfielders was always 60 or 70 yards, resulting in no cover and overlaps of attackers just running through the No 6 channel. Contrast to Galway where in times of danger both midfielders are there to support the heart of their defence before you even get to McInerney. It'll be interesting to see what Brian Cody does on Sunday because he'll have taken Galway's temperature as the game went on on that demoralising day in Salthill. Cody will definitely have copped that McInerney did not come out and go man-to-man with the centre-forward. When Walter Walsh went to No 11, he was standing there for a lot of the day waving his hurl in the air but a Kilkenny defender rarely tried to pick him out. Therein lies one way to get at Galway. You need the confidence and precision to play the ball shoulder high through that middle channel and get the ball pinged to your centre-forward standing on the Galway '65. It's high risk and your passing must be on point because there's so little room to manoeuvre, but the team which shows that bravery to go straight for Galway's throat will be the ones to really rattle them because they'll be on the front foot and running at McInerney. It's like what Tipp have often done with Noel McGrath when he drifts ten yards left and right of the '65 or deeper into his own half of the pitch with the team instructed to play through him. If you start playing through that area with accuracy, you'll have the opportunity to plant your feet and put it over the bar or deliver fast ball inside and take out the cover. And while Burke and Coen are the sweepers in front of McInerney, it's not their natural game. McInerney is constantly roaring at them to come back. I've been watching him in nearly every game they have played together and he's nearly hoarse at the end of every match roaring at them to get back. In Salthill, all you could hear was 'Burkey, come back', he was like that for the whole second half when Walsh was free, while when the camera flashed to Donoghue, he was clearly shouting 'David back, David back'. Their job is to sit but if you get can joy through your centre-forward for 15 or 20 minutes, you make McInerney come out. When he comes out you can put the ball in low in front of Dáithí Burke, something no one has done successfully in the past 18 months. That's because they can't get the ball over McInerney so it's a game of chess, but if you can pull him away from the 'D', you're giving yourself an opportunity to create a one-on-on inside rather than the aerial bombs which Burke will lap up. You can't really get at Burke by going down the flanks, you have to go down the middle so you need your wing-backs to put the ball infield to your centre-forward, who has the courage to stand on the Galway '65 and play from there. It's not really Kilkenny's style to play the way that's needed to break Galway down but a Richie Hogan in his prime would have been the perfect candidate for either the No 11 role or the speedster inside to take on Burke. God knows he did both to Tipp enough times. Someone like Limerick's Kyle Hayes would be ideal because he drifts back to his own '65 to collect possession and he's dangerous when carrying it up the middle; that's one reason why I feel they're best equipped to tackle Galway. If you then get the ball in front of Burke, I think you'll turn him and you need an Aaron Gillane or a Graeme Mulcahy - a smaller, mobile player - because it forces your outfield players to hit the ball in low every time, unless it's a last resort. It's always been a cagey game against the top teams, but you have to get their defence out of shape, you have to drag their centre-back out of his comfort zone. Tactics and whiteboards are all well and good but you could have every plan to beat Galway but then you've to go out and bust yourself up and down the pitch and outwork them. 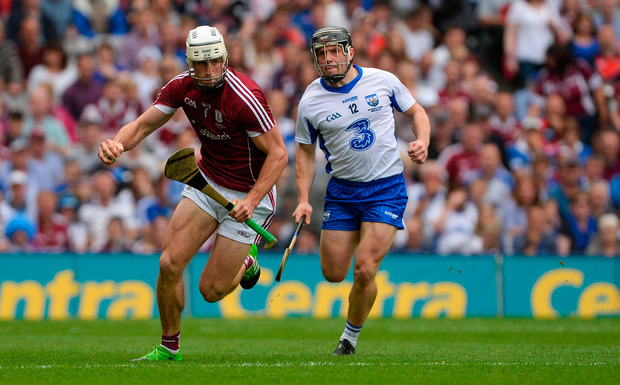 David Burke talks abut Galway being "the hardest working team" and he's right - they have outworked every team in recent memory and taken on board the Kilkenny template from their great team that dominated the noughties. Their wing-forwards go up and down the flanks like there's no tomorrow, they have engines and legs all over the place but if you can match that, you have a chance. That, combined with creating an unease in their defence, is the only way to halt the juggernaut and the team which is finally brave enough to take them on at their own game may just reap the rewards.